Chicago – In patients with early rheumatoid arthritis (RA), seropositive swelling in the knee, jaw, wrist, or elbow is associated with a poorer prognosis relative to no involvement of these joints, according to a phase 3 post-hoc analysis presented at the 2018 ACR/ARHP Annual Meeting. Although swelling in these joints correlated with other signs of aggressive disease, the data were considered sufficiently consistent to suggest that a baseline evaluation of specific joint involvement might help guide management. “RA patients with swelling in these joints early in disease might be considered for more intensive therapy to achieve control more rapidly and reduce the potential for structural damage,” reported Dr. Patrick Durez, Cliniques Universitaires Saint-Luc, Institut de Recherche Expérimentale et Clinique (IREC), Brussels, Belgium. Based on these data, he believes the pattern of early joint involvement is clinically relevant. The evaluation of joint involvement was undertaken with data derived from the phase 3 AGREE trial, which compared the targeted therapy abatacept plus methotrexate to methotrexate alone in treatment-naïve patients with early disease. In that study, which was designed to enroll patients with poor prognostic factors, detailed information was collected on a wide variety of baseline characteristics including swollen joint status in hands, wrists, elbows, shoulders, jaw, knees, ankles, and feet. In order, swollen joint involvement was observed for hands (99%), wrist (92%), ankle (79%), knee (69%), foot (66%), elbow (48%), shoulder (34%) and jaw (9%). Of these, involvement of the wrist, knee, elbow, and jaw was most closely associated with aggressive RA as measured with the Clinical Disease Activity Index (CDAI), the DAS28, and the Simple Disease Activity Index (SDAI). For example, the CDAI was 10 points higher at baseline (53.3 vs. 43.3; P<0.001) in those with seropositive swelling of the jaw relative to those without. When pairwise associations for these joints were evaluated, “swollen shoulder status was significantly associated with swelling status of almost all other joint locations [P<0.001 for elbow, foot, jaw, and knee],” Dr. Durez reported. In contrast, swelling of the wrist was only significantly associated with swelling of the knee and the ankle, while swelling of the foot was significantly associated with ankle swelling only. At baseline, the elevated scores of CDAI, SDAI, and DAS28 did not necessarily correlate with elevated scores on the patient-reported Health Assessment Questionnaire Disability Index (HAQ-DI). For example, in those with baseline swelling of the wrist, the CDAI (45.9 vs. 35.3; P<0.001) and the DAS28 scores (6.3 vs. 5.6; P<0.001) were both significantly higher relative to those without wrist swelling. However, the HAQ-DI score (1.7) was the same in both groups (Fig. 1). 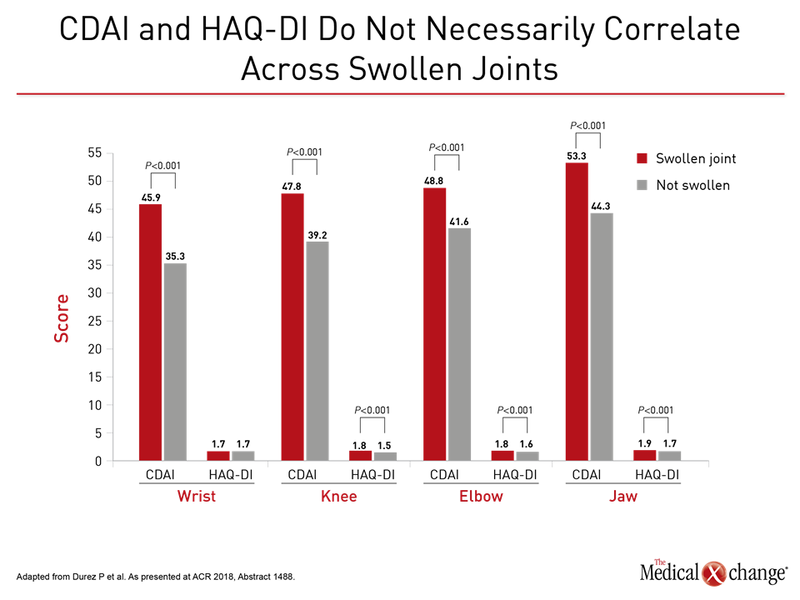 HAQ-DI scores were higher in those with swollen knee (1.8 vs. 1.5; P<0.001) and jaw (1.9 vs. 1.7; P<0.01) joints relative to those without swelling, but Dr. Durez emphasized that specific baseline joint involvement appears to be clinically relevant, reiterating that this is an important area of further research. “There has been limited information about the clinical relevance of specific joint involvement,” Dr. Durez explained. Data from this cohort suggest the pattern of joint involvement at baseline might help stratify patients for severity of disease and help guide the intensity of early intervention.